You know how when you are pregnant, you read all those parenting books and they go on and on about the diaper bag? What to pack. To always be prepared. To be the Boy Scout of Babyhood. I was having two babies… doesn’t that mean I have to pack double?! So, while lying on my right side on complete bed rest, I went on a mission to find the perfect diaper bag. Roomy enough for everything. Classy enough to carry. Light enough to carry with two car seats. Large enough to carry the kitchen sink. You get the point. 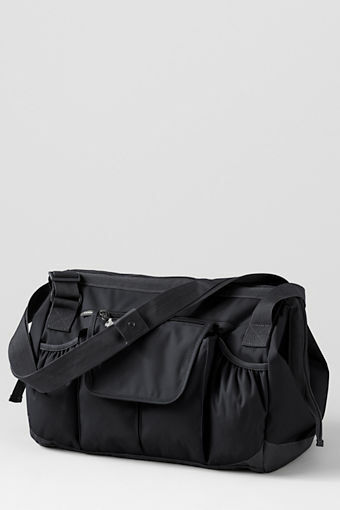 I stumbled across a diaper bag similar to the one below on Land’s End. It was perfect. Roomy. Black. Came with a changing mat. Multiple pockets. Awesome straps. We lovingly packed this diaper bag for the hospital. Several changes of clothes. Diapers. Wipes. Bottles. Formula in little containers. Bottled water. Diaper rash cream. Powder. Spit rags. Extra blankets. You name it, we packed it. I think there might have been a truck in there too, but I am not attesting to anything. We carried this luggage for months. Now, don’t get me wrong… it was an awesome bag. I’ve always had good results with stuff from Land’s End. But, it was big enough to CARRY the kids in. Eventually, we got over the Newbie parent status and began trimming down the diaper bag. Eventually, I switched to one of those carry-all bags from 31. 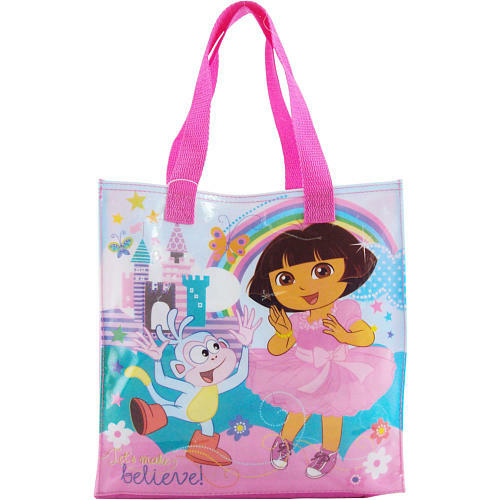 These days, we are carrying a bag similar to the Dora one below. Heck, some days I am an absolute slave driver and make my kids carry their OWN change of clothes and toys. How mean, right? Since moving out on my own, I’ve lived by the adage that if I forgot it, I can buy it. As long as I have my contacts and glasses—I can buy a toothbrush and change of clothes anywhere. I kinda live by the same rule with my kids. Makes life more interesting, you know? So, where is the Land’s End diaper bag these days? I use it for an overnight bag when I travel for work. It works beautifully. Plus… I like being the girl with the smallest bag when traveling in groups. I can buy what I need. By our sixth child, I was down to simply leaving some diapers and wipes floating around the van, unless we were headed out for an all-day soccer tournament. Then I threw in a change of clothes. Funny how much you DON’T need when you have a baby (or two). You’ve been nominated for a Liebster award! Check out my blog to find out all the details! Anymore, I just carry a diaper and a few wipes in my purse….and sometimes not even that. So nice!